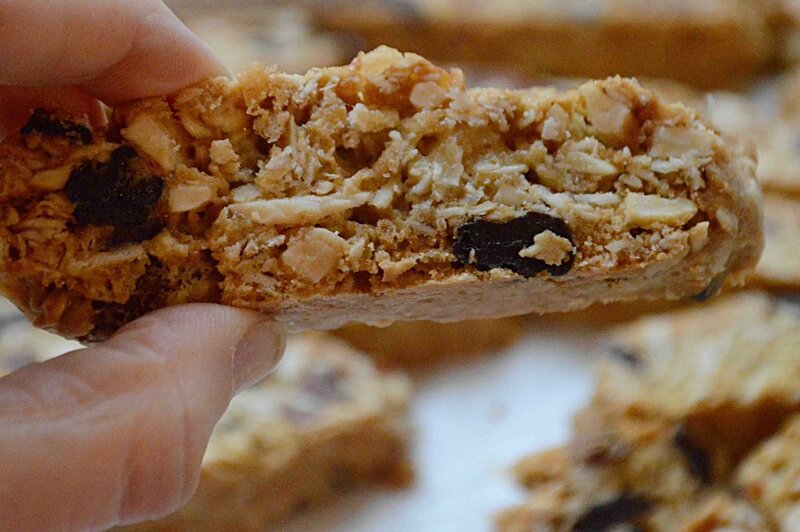 If you're still with me, then let's talk about these delicious, immensely satisfying and fairly sensible Cherry Almond Oatmeal Biscotti. You're in love already, right? 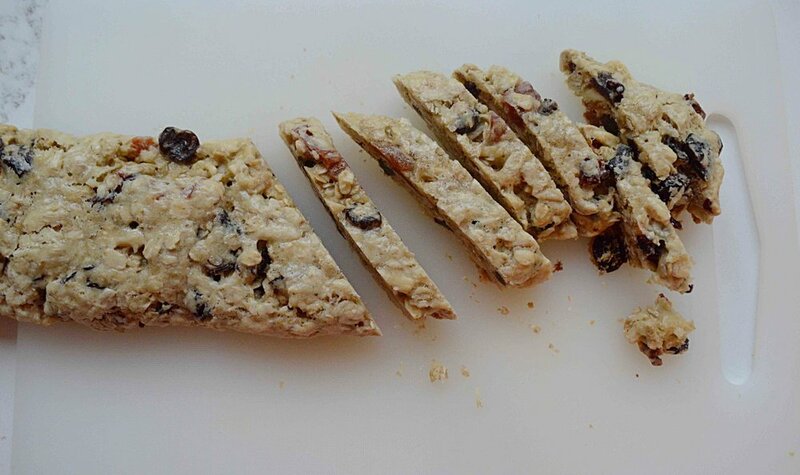 Dried cherries, almonds, oatmeal and unsweetened coconut which I left out of the title but you should NOT leave out of these cookies, makes for a crunchy, chewy, begging-to-be-dipped-in-something-hot treat that won't derail your diet. And they come together easily without a mixer! And because you really do have to chew these, I find that it's not too hard to keep yourself to just one (or two) at any given time. For me, it's the thought of my son's wedding in June keeping me in line--always good to have an event to shoot for! 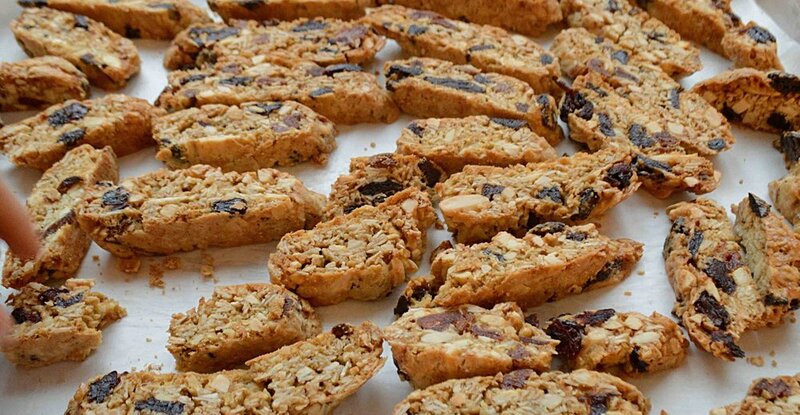 Still...dreaming about that biscotti and a cup of tea tonight! 1. Preheat oven to 325ºF and line a large baking sheet with parchment paper. Set aside. 2. In a medium bowl, mix the flour, oats, baking powder and soda and salt. In a separate large bowl whisk the melted butter and both sugars together. Then add in the eggs and vanilla and whisk again. Use a spoon to stir in the flour mixture, nuts, coconut and dried fruit. The batter will be stiff. 3. Flour a board or your counter as well as your hands. Divide the dough in half and shape each half into a 12-14-inch log and transfer to the prepared baking sheet. Pat each of the logs down so that they become more oval shaped. In a small bowl, beat the egg white until foamy and use a pastry brush to brush it all over the logs. 4. Bake for 20 minutes, until the logs are lightly golden brown and have little cracks on top of them. Let the logs cool on the sheet on a wire rack for 1 hour, then transfer to a cutting board. 5. Use a serrated knife to cut the logs into thin slices on the diagonal, about 1/2-inch slices is good. These might be a bit crumbly and break so be gentle. Transfer the slices back to the baking sheet, laying them down on their sides in an even layer. Bake for 10 minutes, turn then over and then bake for another 10 minutes so that each side is golden brown. Let cool completely. These keep for at least a couple of weeks in an airtight container at room temperature. Note: Recipe adapted from Smitten Kitchen Every Day by Deb Perelman.